The winters here in Kentucky are definitely milder that what I'm use to in Pennsylvania. In Pa. winter starts at the end of October and hangs around till April. To Read More, Click On The Recipe Title. Yesterday I was hanging clothes out on the line. BIG contrast, and I'm gonna take it and run with it. Whatever the temperature is, soup is always welcome. Whether you make it as a light accompaniment in the summer with a salad or a hearty soup with a sandwich to warm your bones with in the winter, we love it. And if you put cheese in the soup , it'll make me absolutely giddy. This recipe came from Allrecipes.com. It was fast and delicious. Paul and I both agree it's the best potato soup we've ever had, and the cheddar cheese had a lot to do with that. I pared this soup with my husbands favorite sandwich, a club sandwich. You can make a club sandwich with any meat you have on hand. I usually make them for him after I've roasted a chicken or beef roast, he really looks forward to it. We hope you enjoy this soup and sandwich as much as we do. Enjoy! I didn't have red potatoes when I made this so I used russet potatoes. I added about a cup more potatoes to the soup, that way I could take my potato masher and mash some of them to make the soup nice and thick and still have pieces of potatoes. I also added about 3/4 cup more cheddar cheese. I love me some cheese! Making a club sandwich is very easy. Start by toasting 3 slices of bread, we use whole wheat. Put mayonnaise on all 3 slices. Fry 3 slices of bacon,and cut into pieces and lay on one slice of mayonnaise bread. Take whatever meat you have on hand....chicken, turkey, roast beef or ham and lay it on top of the bacon. Top this with your second slice of mayonnaise bread. On top of your second slice you can add cheese if you want to along with your lettuce and tomato, top with third slice of mayonnaise bread. It's one terrific sandwich! What a great soup recipe! Sounds so delicious and that sandwhich...omg....my mouth is drooling! You've outdone yourself girl! I didn't know you had moved to KY! We're practically next door neighbors or next state neighbors! Talk about the perfect meal for the cold, blustery weather we're having. the soup and the sandwich look so decadent! 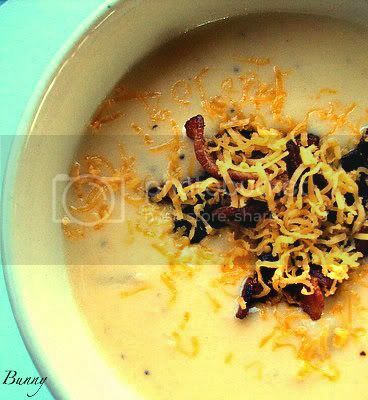 Oh yum - I love potato soup and this looks like it's full of the best things ever. 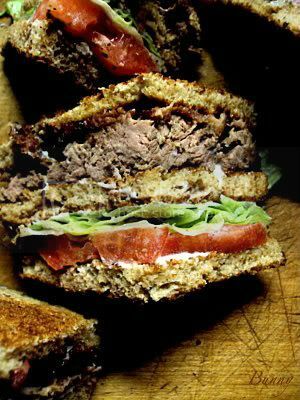 Love this Roast beef Club sandwich, wonderful!! both of these would make a fine meal by themselves, but together, what a feast! I made this potato soup (sans bacon or ham) a few days ago! I was indeed warming and delicious. If I was intelligent, I would have made those sandwiches to go along with it. So, you are in Kentucky now! Happiness to you! Feeling the warmth. Katherine you are like 3 hrs from me right...depending on where you are in Tennessee? Claudia, yes I moved here in June, Paul and I married in July. I absolutely love it here! A great combo and so delicious. I lived in NY growing up and moved to Virginia over 20 years ago...the winters are definitely milder here too and I'm so thankful for that. I can't stand snow! yum! I love me some extra cheese too. Never had a club with roast beef but I will soon! Mmm, that looks like good food! WOW - both this sandwich and soup have delicious and comfort written all over them. Thank you Krystal!! Thank you for stopping by!